There is strong evidence that regular dietary advice, provided by dietitians, improves blood glucose control by improving diet. The National Institute for Health and Care Excellence (NICE) recommends that all people with Type 2 diabetes should receive individualised, on-going dietary advice from a health professional with expertise in nutrition, but many people aren’t getting this. Unfortunately, there are not enough specialist diabetes dietitians employed to provide this level of service, and there is considerable variation in provision. For example, the community dietetic service for people living in the north, inner city and east of Bristol is run by a different provider, on a different model, from that provided for people in South and West Bristol. In the current environment the majority of people with Type 2 diabetes get their routine dietary advice from their GPs, practice nurses or community pharmacists. 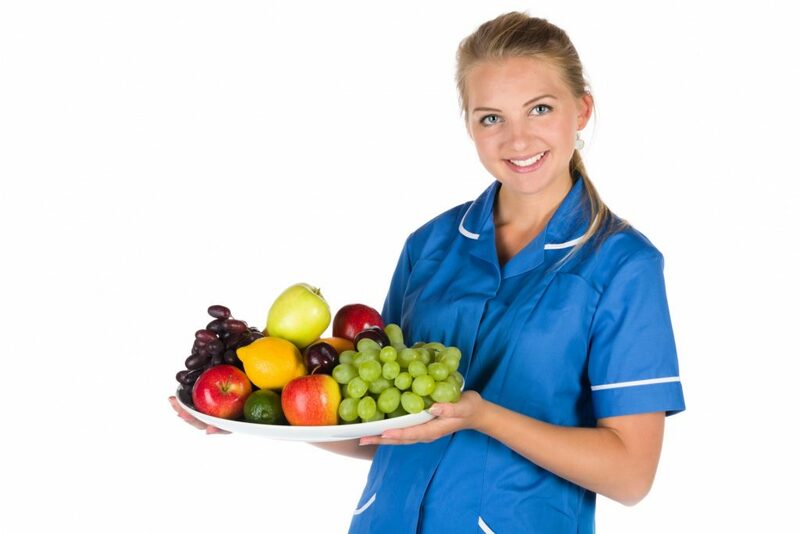 Some of these health professionals do an excellent job in providing good quality dietary advice but many say that feel they do not have the expertise to assess diets and give individualised advice. I have often heard people with Type 2 diabetes saying that the dietary advice they receive from their general practice is generic, and they struggle to see how to apply the advice they are given to make specific, beneficial changes to their own dietary habits. With this in mind, clinicians and academics at the Centre for Exercise, Nutrition and Health Sciences and School of Clinical Sciences felt there was a need for a brief dietary assessment tool that helps people assess their diets, and enables them to set dietary goals based on this assessment. Over the last three years we have worked with dietitians, nurses, GPs and people with Type 2 diabetes to develop a brief dietary questionnaire to rapidly assess the dietary habits thought to be of most importance for people with Type 2 diabetes. 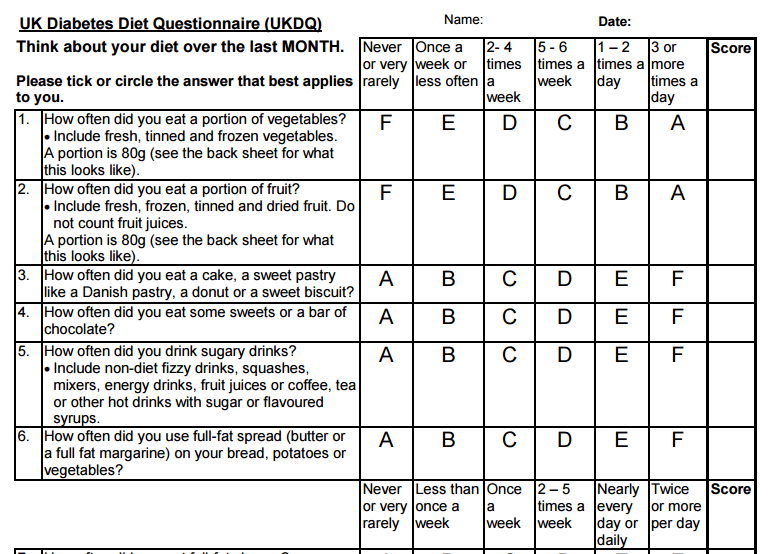 The resulting questionnaire, the UK Diabetes and Diet Questionnaire (UKDDQ), asks about consumption of higher energy foods and drinks, fruit, vegetables, oily fish, common higher fibre cereal foods and meal patterns. It takes roughly 10 minutes to complete and can be self-scored.We have just published the validation paper, which showed it to be reliable and compares as well with food diaries as other short dietary questionnaires. 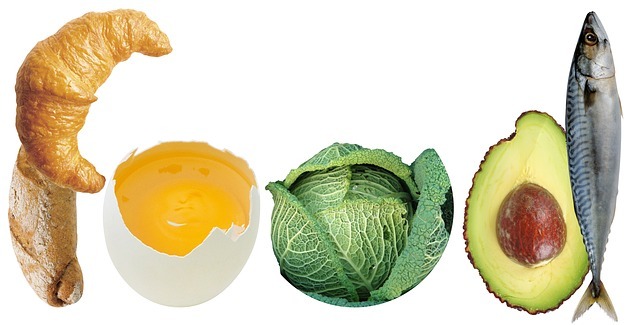 The UKDDQ is publicly available for download and is equally applicable to people with a diagnosis of Type 2 diabetes, those at risk of Type 2 diabetes and the general population interested in healthy eating. Since the initial development, we have also worked with other researchers from the School of Sport, Exercise and Rehabilitation Science at the University of Birmingham, to check that the questionnaire is relevant to South Asian people (and made a few small changes to wording) and the UKDDQ was adopted by Birmingham South and Central Clinical Commissioning Group as the tool used for dietary assessment in the initial phase of the NHS Diabetes Prevention Programme. We believe that using the UKDDQ in clinical practice would promote dietary change in people with, or at high risk of, Type 2 diabetes more effectively than the existing generic advice that people are currently hearing. We are planning further work to demonstrate this and would welcome interest from health professionals or people with Type 2 diabetes who would like to be involved in the project. This article was originally posted on the School for Policy Studies blog. 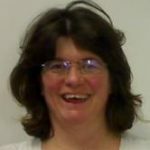 This entry was posted in Governance and public services, Health and wellbeing, Methodologies and data analysis, Research and tagged Bristol Nutrition BRU, Centre for Exercise, diabetes, dietary advice, dietary questionnaire, health, nutrition, Nutrition and Health Sciences, Research, Type 2 diabetes, UKDDQ by policybristol. Bookmark the permalink.